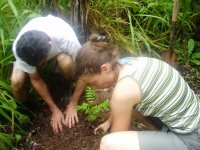 We believe we offer the best service for your trip to Costa Rica. 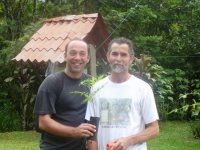 Please hear what our clients are saying about Green Creation Costa Rica Travel Agency. I wanted to thank you very much for organizing my trip so well, I had such a brilliant holiday !!! Everything was perfect, your itinerary, the hotels, the transportation, the tours...not a single problem !!! Your country is so beautiful and the people so welcoming and warm. My memory is full of unforgettable moments and they will last for long !... I would especially recommend the Banana Azul hotel in Puerto Viejo, such a nice venue with a very friendly and competent staff and also the Cahuita tour where I had a terrific time! The snorkeling was great ( Albert, the guide went snorkeling with me and we saw sharks, Octopuses, Lobsters and so many beautiful fishes) and so was the hike to follow ! I will definitely try to come back and explore more of your country and for sure you are the person I will contact to organize it !!! Thank you for the message; we arrived home late last Thursday, and have been quite busy catching up with work. We had one of our best vacations ever, and want to thank you for the wonderful job you did organizing everything. All of the transportation arrived on time, the hotel staff, tour guides and everyone else we dealt with were expecting us, and were friendly, helpful and very efficient. We loved Costa Rica and the people; we never dreamed it would all be so nice! We will recommend you and your company to everyone we know who is thinking about taking a vacation, and see if our local newspaper will publish an article about our trip (if so, we will send you a copy.) Thank you also for the nice gift; it was very thoughtful. Again, you did an outstanding job; the North American travel industry could learn a lot from you - pura vida! 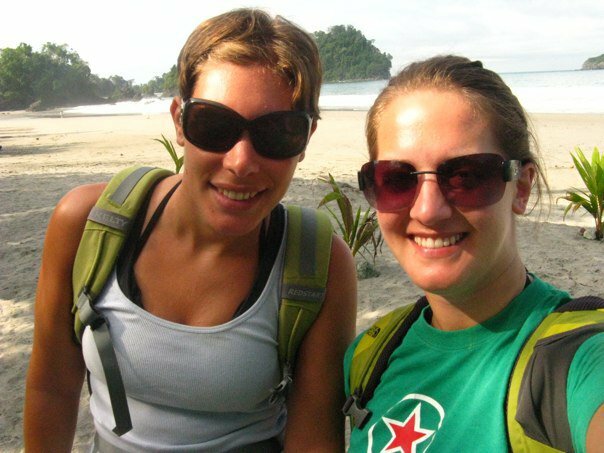 Kelley and I just wanted to say a big thank you for booking our trip for us to Costa Rica. We had an incredible time and your country is SO beautiful!!!! A friend may be contacting you regarding a trip. Her name is Carole-Anne O'Neill and she just got married! Below is a picture of Kelley and myself on Playa Espadilla. Thanks again! Costa Rica was beautiful, safe, clean, orderly and lots of fun. It was the best vacation trip I have ever been on, and I have traveled a great deal. My partner said the same, and she has taken several vacation tours to Mexico and other Latin American countries but said that Costa Rica was much nicer and safer - and we didn't have to worry about drinking unsafe water. We were so impressed with how well organized everything was - Green Creations did a terrific job of putting together a tour that fit our interests and our time constraints. The hotels and activities were just as promised, and the shuttle drivers were always prompt (sometimes even a little early) and friendly in picking us up to go to and from each activity. it was effortless! The voucher system made it very easy for us to know what activities were coming up, and your company did an outstanding job of communicating and arranging everything. I especially commend Green Creations for using Interbus for transportation. On our last night in Costa Rica, I left a small package of t-shirts in the shuttle van when we were dropped off at our hotel. The next morning at 7:30 a.m. I called Interbus (which I could do because Green Creations included contact information for everything - thanks!) to see if the package had been found. Ordinarily I would never expect to recover a lost item such as this, but the tour operators and service providers had been so professional that I decided to try. When I called, the dispatcher immediately found our trip information in the computer, what van and what driver we had used, then said that the package had been found and locked up in a secured area in a small office. We were scheduled to leave for the airport at 9 a.m., and the person with the key to that office was not due to work until 10 a.m., but the Interbus man said to "give me some minutes" and he would call back. Shortly after, he called to say that our package would be dropped off at our hotel in less than 15 minutes, and it was. We could not believe that such organization, honesty and promptness was possible! We are telling our friends to go to Costa Rica for a beautiful vacation destination that is safe, clean and modern. The river rafting was especially exhilarating, and the river guides were professional but also so much fun! 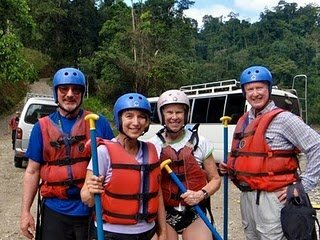 Even though we had never been rafting, their expert instructions had us right up to speed and we did very well and had a wonderful time. The scenery along the route was spectacular, and we were glad that the the rafting company takes pictures of each group during the activity. We thought we would have to have the pictures mailed to us, but by the time we got back to the base, the discs had been copied, labeled and were ready to go. Amazing! 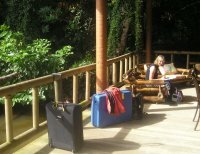 I am from Southern California, and have seen some very nice spa facilities there and in other parts of the world, but the Tabacon spa and hot springs was far above anything I have experienced before. There were more than a dozen clean, flowing pools of water of different temperatures available, with wonderful gardens all around. The swim-up bar in the largest pool had excellent drinks at reasonable prices, and the changing and shower areas were clean and well organized. The restaurant buffet at Tabacon was very impressive as well. That was an experience to remember! Thank you Adriana and Green Creations for arranging such a fun and well-organized excursion, and on such short notice. It was our first trip to Costa Rica, but will certainly not be our last. We are telling our friends that Green Creations is the way to go for a safe, fun vacation that is well tailored to the activity level of the guests. We will definitely be seeing more of your beautiful country! The hardest aspect of writing about Green Creation Costa Rica is limiting the amount of great things I write. From the second we left the airport, we were greeted with smiles and professionalism. After seeing other guides and buses outside, I was nervous about what our group would be using. However, Green Creation fulfilled every expectations and then some. They literally had the nicest bus and most professionally dressed guide in sight! From this first impression on Green Creation never failed to impress. The itinerary was executed flawlessly and beyond expectations. Without their immediate email responses and excellent suggestions, our group of 11 would not have had one of the best trips of our lives! Thank you for everything. We had a wonderful time and we did arrive home safely. Between my friend and I, we came up some things we experienced along the way that might be helpful for you to know. - Arnulfo was great. He answered all of our questions, which was especially important in the very beginning. - The rafting trip was terrific. It seems as though that company was very well put together. Everything, from our individual guide to the meals they provided to their location's setup was very customer friendly. We loved the coffee tour. It was the perfect mix of education and entertainment. Our tour guide was perfect. 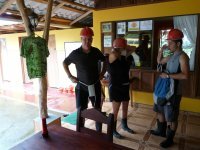 -The zip lining company was also very efficient and provided a great experience. Despite what looked like a huge crowd of customers, we never felt like we were waiting in line at a theme park. - The staff at the Arenal volcano lodge was stellar. They worked to accommodate us at every turn. It was really a wonderful time, and surely something we'll always remember. Thanks very much for your help and accessibility throughout! We will be in touch when it comes time to book our next trip to Costa Rica!!! Well, we are back in Canada, and wanted you to know that we had a wonderful holiday once again. 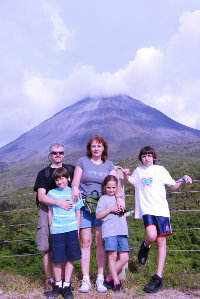 We were so lucky this time – to see the Arenal Volcano during our stay at Arenal. It was magnificent! Especially at night when the lava rocks flowed down the mountain. What a sight! The Tabacon Hot Springs were magical as well. We loved our stay in Monteverde. The zip lining was absolutely awesome! I think the best in the world! We also saw both a male and female Quatzal birds. They were so beautiful. That was completely unexpected.The Fonda Vela hotel was lovely. The rooms were huge, and very comfortable. And once again, we had a serene few days in Montezuma at Ylang Ylang. Such a beautiful hotel, and excellent food! We highly recommend their banana coladas! We did a lot of driving, and really got to see a lot of the country. Everyone is so friendly in Costa Rica. Thank you so much for all your assistance and making our trip so easy!! Pura Vida! Hi Marcela. We had such a great time and love the Costa Rican people! They were so friendly and everyone associated with your tour office was especially helpful and acoomodating. 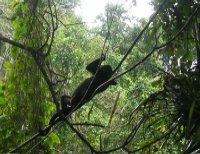 To give you an example, on the way from our Villa in Santa Teresa back to Tambor, I mentioned that I was upset because I had been in the country for a week and had not seen one monkey. I had heard that monkeys were a highlight and easy to find and that I was so dissapointed to go home and not see one. From that moment the taxi driver (oh, I forgot his name now) started looking in trees as he drove. how) and stopped the car. I got out with my camera and followed him. He clapped and woke up a holler monkey up in the tree for me to see and take pictures of. I was so excited to see this (Yes, I am a city girl) and he was so nice to go to this extra effort for us. The cab driver to the San Jose airport was also especially knowledgable about the wildlife and and Costa Rica in general and gave us a lot of information. Everyone was just great. Nathan and I talked about you today and what great work you do. it was a very nice trip. We enjoyed every minute of our staying in Costa Rica. We made about 1000 pictures and 1-1.5 hour's video. So everything was perfect. And many thanks for your assistance in organizing this trip. I will recommend to all my colleague to visit your great country. The hotels were perfect, and I was quite impressed! Thanks for everything and take good care of your health. Also thanks a lot for the present. Really cute! Nice to hear from you! Here in Belgium it's still cold and snowy, so we're still thinking about Costa Rica all the time. I was just planning to write you an e-mail to thank you for our fantastic stay in Costa Rica. You did a wonderfull job ! Everything was well-organised, the hotels were nice, the food was lovely and the people very friendly. We will certainly recommend you to all our friends and family. We hope to visit your country once again. I will tell all my friends about your great service! We had a great time and thank you for doing such a good job. You were on top of everything taking care of us. You will definitely be recommended by us to any friends looking for a travel agent in the area. Have a good day and thanks again for everything. The people of Costa Rica were very nice. We even took in a soccer game while in San Jose. That was an experience. All the places where we were, the cabinas, the transportation, everyone was very nice with us, always smiling, good conditions...it's really PURA VIDA! 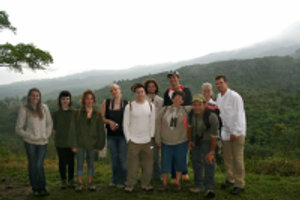 Thank you for all your help in arranging our trip to Costa Rica. We have arrived home safely after a fun-filled vacation. 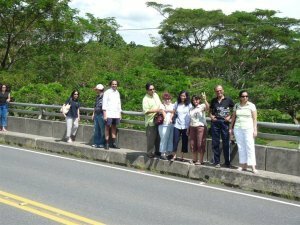 We enjoyed all the activities, the warm weather and warm hospitality in CR. Your assistance was much appreciated and we will certainly recommend your services to our friends. Thank you so much for arranging everything for our trip. We had a great time enjoying all the sights and activities of Costa Rica. It has been hard getting back to reality. I wanted to let you know we had an awesome time in your beautiful country! You did a great job of setting everything up. Kristina and I had no worries what so ever! It was nice not to have to think and just know everything has been taken care of. I have recommended you to all my friends. After seeing my pictures everyone wants to go! Thank you so much! 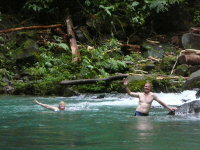 The rafting guide and the snorkling guide were great and I would love to thank them. Thank you again and I will be back to visit and I will always use Green Creation as my travel agency. Everything worked out well on our trip home. Vancouver was rainy and +5 degrees. Edmonton was sunny and -21 degrees. Aparently I missed a cold spell of minus 48. I think I like your bad weather a lot better. It was my pleasure to meet you in your lovely country. I am most certain that I will return at some stage. Thank you for your personal attention and the well organized trip. I'll get back to you after Christmas. Hope you are doing fine. 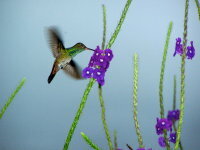 I would like to once again thank you for the wonderful arrangemtns you made for us in Costa Rica. All the members in our group had a great time - thanks to your excellent planning.Special thanks to Juan. He made the travel and the tours very enjoyable. He took really good care of us and we truly appreciate that. 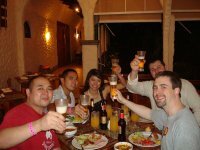 I will defintely recommend you and your travel agency to any of my frineds planning a visit to Costa Rica. We had such a great time - we may plan to come back there again. 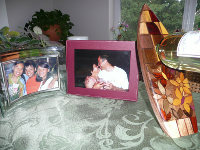 We have some pictures we took while we were there which we will send to you and Juan. Absolutely enjoyed ourselves. Ronald is a doll. It was the best decision I could have made, to get a private tour driver, made our time much more relaxing. He went above and beyond to help us in everyway, and we do appreciate everything. I would recommend your company anytime. I am sure Ronald was quite exhausted after trying to keep up with me!! Thanks for your Christmas wishes and here are mine attached, too! I think I can speak for my friend Conny as well in saying that we truly enjoyed meeting such nice people like you and Ricardo and that we were totally impressed by your commitment to detail with our trip planning. It was topped up by that personal touch when you came to pick us up from Calalu restaurant and delivered us to our hotel with Ricardo carrying those heavy suitcases. Unforgettable! By the way, your welcome gift is already on the wall in our house and looks very nice. I most definitely would like to come back to Costa Rica and explore the Pacific side. We will see. Just wanted to let you know that I'm now back home after an amazing trip to Costa Rica! Everything was just perfect from the time I arrived until I left. Thank you for all your help and advice. You are a true "tica" - warm, friendly and very hospitable Thanks for giving me such an incredible vacation! Hopefully we'll meet again sometime in the not-too-distant future. Hope all goes well for your mother.Our prayers are with you. We had the most wonderful time at Costa Rica. The trip went very smoothly, without any hitch. Thank you for planning it so well. Of course, Ronald was great! He was always there for us, taking care of our smallest needs. He was not only a wonderful guide, but also a genuinely caring person. He was very patient with us and never lost his temper. Everything went as scheduled. He took us to nice restaurants. We were happy to have sugarcane juice and coconut water. The only mishap was when I fell in the water during the rafting. It shook me a bit. But I recovered eventually. All other activities were well enjoyed by all of us. Thanks again for making our vacation memorable. Sushma and the Florida group. We had an amazing time! Thank you for putting everything together and making our week in Costa Rica extremely easy for us. All transfers, tours and hotel accommodations were ready on-time and were exactly what we had asked for. 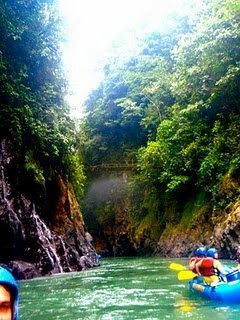 We will not hesitate to pass on your information to friends/family that might have interest in touring Costa Rica one day. This was my fourth trip to Costa Rica and my most enjoyable by far. All the mundane details like booking hotels and cars and excursions were handled by Adriana and her staff. It seemed to me that we were greeted and treated by the hotels and car rental people more graciously than the times I had made my own reservations. Adriana made any adjustments to the itinerary that I requested without hesitation, and came up with suggestions that suited my needs perfectly. All we had to do was enjoy the country, the weather, the scenery and the people. I won't be traveling to Costa Rica without her help again. I'm so sorry for not getting back to you sooner! After our trip I got terribly busy with school. But I'm happy to say that we enjoyed every part of our trip! It was fantastic and just what we were looking for. All of our transports were incredibly kind and accommodating as well as the staff in each of the hotels. At the end we left Costa Rica feeling so happy to have gotten to know the country and spend our Holiday doing something different. I don't hesitate to recommend Green Creation to anyone looking to travel there and I thank you for everything you did to plan our trip. I just wanted to say how much I enjoyed my tour of Costa Rica. I appreciate the transfers between locations as they got us there much faster. I also appreciate that you are local and was able to be contacted by cell phone. Thanks again for your help on this trip and the extra efforts you put into it. Hi Karen. We had a wonderful time in Costa Rica and the hotels and service was great. All of our excursions were great and we have no complaints at all. Thank you so much for all your help and we will tell all of our friends about you beautiful country and your travel service. We want to thank you for organizing such a wonderful trip for us. We were very impressed with all of the hotels, they were very nice and comfortable. We were actually surprised how nice the hotels were because the whole tour was pretty inexpensive. The activities you planned were great, and the timing of everything was perfect. We were very satisfied with the whole experience and will definitely recommend your services to anyone we know that will be going to Costa Rica. Again thank you so much, we thought that you did a great job! we got back home without problems. We had a great time in your country. Amazed by the richness of fauna and flora of the different places we have visited. I would love to go back to Manuel Antonio to spend more days at the beach and watch the monkies again. Monteverde was very exciting, we had an excellent tour guide who pointed out a lot of exotic plants and animals-even two quetzals. We wanted to thank you for helping to organize this memorable trip. Hope to be back in the future! Please say hi to Marcela and Arnulfo. And thanks a lot for the beautiful gift we got. I wanted to thank you, Marcella and Adrianna for all your help in getting me on the tour that I wanted. 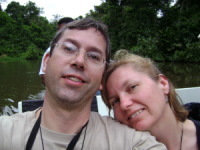 I had a wonderful time at Poas, La Paz, and especially the Sariquipi river tour and canopy. Everything worked out perfectly. My friends were amazed that I saw a clear view of the volcano and I have beautiful pictures. You all were very gracious and kind and I will recommend your company in the future. greetings and that`s good that our country chocolate liked you. We are allfine. 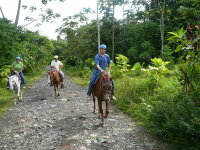 We are very pleased of trip and recommend to visit Costa Rica for all the people. The trip was just fantastic. 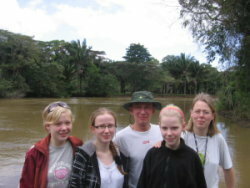 We send you some pictures about our trip for your web site. I just wanted to thank you for your help in planning this amazing vacation. Everything was perfect. All transfers were there on time and friendly. All excursions were a great time. Pure Trek Canyoning was amazing! 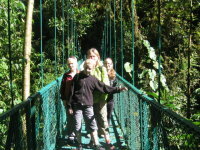 But our guides on the Hanging Bridge tour and at Manuel Antonio Park were so nice, knowledgeable and great. The hotels were great, especially Peace Lodge! You should encourage everyone to stay there. I will be sharing the pictures and stories of our trip with friends, along with a recommendation that they visit Costa Rica. And that they work with YOU to arrange it. I did not get a chance to call you and thank you for not only a wonderful vacation but excellent customer service. Adrianna, you went above and beyond. You deserve customer service rep of the year. We have returned to Barbados singing your praises. You have now made it difficulty for anyone to follow suit and for us to expect anything less. Adrianna, all of the tours/activities which were suggested and arranged were fantastic and we only have great memories and memoirs. On behalf of the Bajan/Jamaican crew I again thank you for a wonderful vacation. a happy new year and thank you for a perfect holiday in Costa Rica. You made a fantastic program for us, everything went very smoothly and we just love your country. Greetings from a cold (-5 degrees C) Sweden. Thank you, Arnulfo, Ronald, Alex, and whoever else helped for the excellent arrangement of our vacation! We enjoyed it a lot. Also thank you very much for the beautiful bottle holder, see attachment. 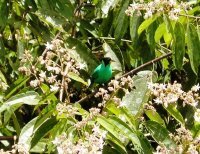 Wishing you and Green Costa Rica much happiness in 2008! I have been meaning to write and tell you all about our wonderful vacation, but have been so busy at the office since my return. I am so pleased to tell you that all of our flights, transfers and excursions were successful. Our Sansa and Nature Air flights went much smoother this time around, so we were so relieved! Bosque del Cabo was as amazing as ever! We saw toucans, macaws, pizotes, howler monkeys, and spider monkeys almost every day! Even though it is very hot, we just love the Osa Peninsula! My girls especially enjoyed the surfing lessons we did at Matapalo! The 85 degree ocean temperatures are something we don't have in the United States and we absolutely loved how easy it was to get into. Our first time at Arenal Nayara was also amazing. We just loved the wonderful town of La Fortuna and just fell in love with the food and the people. The Typical food was so delicious and we ate it almost every day! 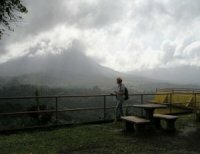 The clouds of Arenal cooperated as well and we saw Arenal every day and even heard an eruption on our volcano hike. Our volcano tour guide was terrific, fun and energetic. 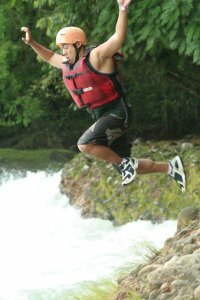 The zip line and white water rafting were the most amazing excursions ever! Both tour guides were very safety conscious and humorous. My girls responded well to our rafting guide "Tom" and he was very entertaining and informative. He even stop on the river to show us a Slooth. The delicous pineapple and Typical food we were treated to after our ride down the river was very tasty too! All in all we had a wonderful vacation with the volcano hike, zip line and white water rafting being our favorite adventures! 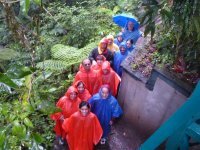 La Fortuna was such a fun place that I'm sure we will be back again some day for a visit. So please keep us in mind a year or two from now when some great specials come your way. I'll send you our pictures shortly so you can what a great time we had ...thanks to all your wonderful arrangements!